The old adage, “There’s never enough time in the day,” may be true, but project leaders know how to manage their time effectively. Leadership coach Susanne Madsen shows you how. It’s not that you can do everything, Susanne noted, but if you look over your task list and decide which of the items must be done immediately and which have more time to complete, then you can get what needs to be done. You probably are a pro at scheduling multiple teams over many different projects because of your experience and having read our article on time tracking. But how do you rate managing your own time? Often we’re able to see how to help others and fail at seeing where we need help. Susanne offered these tips to improve your time management. The more you practice utilizing your time wisely, the better you get at it, like exercising a muscle. Pro-Tip: Business coach Brian Tracy says in his book Eat That Frog!, eat the ugly thing first. By that he means take the task that you must do, regardless of what you think about it, and get it done first. By focusing on the tough stuff, the rest becomes easy. Hi, I’m Susanne Madsen. 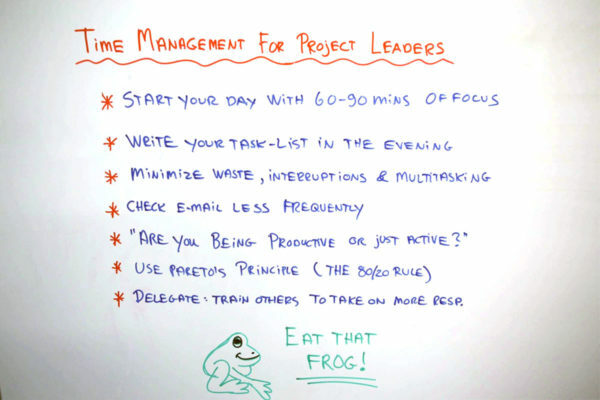 Welcome to this whiteboard session on Time Management for Project Leaders. Many people are so busy that they have difficulties getting through everything in a day. You might recognize this from your own work. That’s why it’s so important that we focus well, that we spend our time well, and that we have the top items at the top of our priority list. Let’s look at some tips for how you can do that. First of all I recommend that you start your day with 60 to 90 minutes of clear focus. We’re actually fresher in the morning. Our brains work better. It’s like a computer program. The more you layer on top, the slower it goes. So utilize that time in the morning. Brian Tracy says it in a different way. He has written the bestselling book Eat That Frog! And he says, “Eat the ugliest frog first.” The frog symbolizes the ugly task that we’re procrastinating on. It’s a task that we need to do. It’s important, but we just somehow tend to delay it because we find it unpleasant. To get results and to optimize time best, we have to get through those frogs. So you can also consider those 60 to 90 minutes of clear focus in the morning as frog eating time. Another tip is that you should write your task list or to-do list in the evening, not in the morning. When you write it in the evening you can come to the office and you are focused straight away on what needs to get done. You might even have your top three frogs, or your top three items to handle. Next, minimum waste. Of course minimize interruptions and multitasking. It’s a myth that we work well when we multitask. Studies show that only 4% of the population are true multitaskers. They have two processes in the brain and can do two things at once. But the rest of use, 96%, I do believe I’m part of those 96%. We can’t do that. When we allegedly multitask, we jump very quickly from one task to the other. And as we do so we lose momentum. We slow ourselves down. So focus single-mindedly on your activities, especially when you are in your frog eating mood in the morning. Then when you get interrupted later in the day it doesn’t matter so much because you already got your most important task completed. Check email less frequently. How about that? A lot of people still have an email notification popup whenever they get a new email. But again it interrupts us. It breaks our flow. You can also try to check email less frequently. For instance by saying, “Okay, I want to check email every hour, or three times a day.” It is possible. Why don’t you try to experiment with it? I also encourage that you ask this question at random times during the day. Am I being productive or just active? You see there is a very big different. Many of us are very active. We get lots of stuff done, and we may even leave the office thinking, “Oh, my God, I’m exhausted. I got so much done today.” But was it the right things that you got done? Were you really productive? Did your tasks add a lot of value? So this one can be really interesting if you ask yourself that throughout the day. You can also use Pareto’s principle. Also known as the 80/20 rule. It will help you understand what your highest value tasks are. What are the 20% of activities or tasks that you do during a day or a week that add to 80% of your results? That’s where your focus needs to be. The remaining 80%, you may begin to delegate. Train others to take on more responsibility. That’s a fabulous way to free yourself up. Why not get a project administrator on board? That will help you to focus on your highest value activities. But remember what Brian Tracy says. Eat that frog. Eat the ugliest frog first. Thank you for watching. Please visit us again at ProjectManager.com.